A combination of beautiful natural landscapes and the dynamic history of villages such as Hill End, Carcoar, Sofala and Millthorpe have created a unique attraction for visual artists in the Bathurst region since 1815. 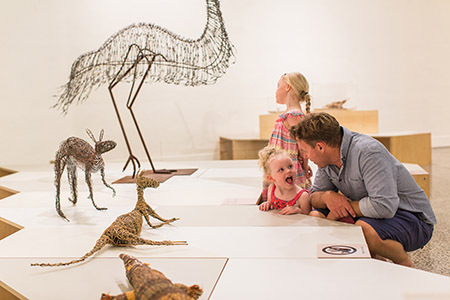 Bathurst Regional Art Gallery has forged strong links with surrounding townships and within the local community to create a vibrant space showcasing the full spectrum of artistic endeavour. Built in 1989, it was the first purpose built regional gallery in NSW, and provides professional development opportunities for local and regional artists. The Gallery is a creator of quality touring exhibitions, and operates the highly celebrated Hill End Artists in Residence Program. 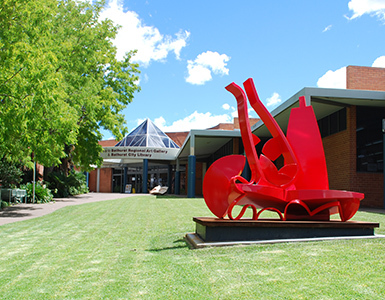 Located on historic Keppel Street, Bathurst Regional Art Gallery is a modern, well-equipped and highly celebrated regional gallery. Bathurst Regional Art Gallery's mission is to ensure an efficient and effective Gallery operation that reaches out to the community through education and lifelong learning, through its support for the professional development of local artists as well as Gallery staff; through public programs which challenge thinking, stimulate creativity and promote cultural enrichment; through the development and care of the permanent collection; through its support for a network of artists' studios and through temporary exhibitions and research. Bathurst Regional Art Gallery (BRAG) is one of the oldest regional galleries in NSW. It is a professionally staffed facility owned and operated by Bathurst Regional Council. The collection began in May 1955 when Jean Bellette was awarded the inaugural Carillon City Festival Prize of 100 guineas for her oil painting entitled Still Life. Over 6,000 people viewed the competition. The Festival Arts Committee eventually built on this community support for the visual arts in Bathurst and established an Art Gallery where small exhibitions could be held and where winning works from the Carillon City Festival Prize could be hung. In 1959 an Art Gallery within the Council Chambers was opened, where it continued to thrive until moving into a new purpose built building in 1990. Since then, the gallery has continued to enjoy widespread community support and to develop a reputation as one of the leading regional galleries in New South Wales. A diverse exhibition program, a focus on community access and a commitment to the provision of innovative educational and public programs underpin the gallery's operations. BRAG averages a visitation of 30,000 people a year, well above the national average for a regional gallery. Bathurst is located on the banks of the Macquarie River in the Central Tablelands Region of New South Wales. It is home to the Wiradjuri people and is the site of Australia's oldest inland European settlement. Bathurst is one of the region's most beautiful cities, offering a diversity of attractions, activities and facilities. For more information on Bathurst click here to access the Visitor's Centre website. Approximately 200kms west of Sydney, Bathurst is a comfortable two and a half hours drive from Sydney and three and a half hours from the National Capital, Canberra. Located on historic Keppel Street, the Gallery is next to the Bathurst City Library and close to some of the city's best restaurants and cafes. Parking can be accessed from Seymour St. BRAG is wheelchair friendly. Bathurst Regional Art Gallery is managed by an experienced team of professionals that includes a full-time Director, Curator, Collections Manager and Audience Engagement Officer, as well as a part time Gallery Administrator and Curatorial Assistant. The Gallery also has a team of casuals who assist with front of house duties, exhibition change-overs and events. IMAGES (L to R): Philip Spelman redjar redbottle 2013. steel, automobile paint. Acquired from Sculpture by the Sea, Bondi 2013, made possible through Sculpture by the Sea, and the Regional NSW Acquisition Program supported by the NSW Government through Arts NSW and Bathurst Regional Council. Photo: Emma Hill. Family visit to BRAG - Menagerie: Contemporary Indigenous Sculpture. December 2014. ©Katie Peters Photography.